My kids haven't manifested any allergies yet, thankfully, but Roo has several friends who have significant dietary restrictions. I know it's a constant struggle to find foods that my own kids will eat so I can't really imagine how difficult it would be to cook for kids without nuts, eggs, or dairy. When Kelly Rudnicki's second son was diagnosed with multiple severe food allergies, as well as asthma, she began her quest to learn as much as she could about allergen-free cooking. Her blog, The Food Allergy Mama, features tons of recipes and helpful information for other parents to learn from. 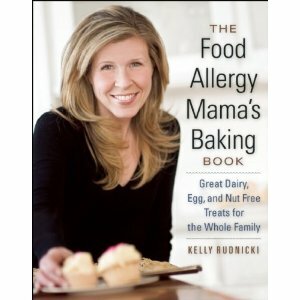 Kelly recently published The Food Allergy Mama’s Baking Book, a compendium of recipes that are completely nut, egg, and dairy-free. These recipes are as tasty as their allergen-laden counterparts but they make it easier for kids with allergies to share in the holiday feasting. There are familiar gifting items like pumpkin bread and gingerbread kid cookies as well as more elegant fare such as a dairy-free cheesecake. (It should be noted that these recipes are not gluten-free.) One thing she stresses is using quality ingredients: "I'm a real stickler about the vanilla I use. There are some ingredients you can't go cheap; this is one of them. Nielsen-Massey's is top of the line. Get the good stuff, and you'll see a real difference in your baking results," Rudnicki said. Impress your family with these donuts on a chilly morning! In a large, heavy pot, heat 2 to 3 inches of vegetable oil until a candy thermometer inserted in the oil reaches 375ºF. Meanwhile, in the bowl of a stand mixer fitted with the paddle attachment, combine the applesauce, vanilla, and ¾ cups flour, baking powder, 1 teaspoon cinnamon, nutmeg, and salt with a wire whisk. Add the flour mixture and the soy milk alternately to the applesauce - margarine mixture. Add more flour, if needed, to make a smooth and not-too-sticky dough. Transfer the dough to a lightly floured board. Knead for about 1 minute, and roll out to a ½-inch-thick circle. Dip a doughnut cutter into flour, and cut into the dough. Remove the trimmings and reroll, repeating the process. Slide a few doughnuts into the hot oil, being careful not to crowd the pot. Fry until the doughnuts rise to the surface, about 2 minutes, and turn over with metal tongs to fry the other side. Doughnuts should be golden brown on both sides. Lift out the doughnuts with metal tongs and drain on paper towels. Mix together the ½ cup sugar and the 2 teaspoons cinnamon. Place the cinnamon - sugar mixture in a brown paper lunch bag. Place the warm doughnuts, one at a time, in the brown bag, and shake to coat. Shake off excess sugar, and place on a serving platter. Repeat with remaining doughnuts. Note: If you don't have a doughnut cutter, use a 3-inch biscuit cutter instead. To make the doughnut holes, use an empty, sterilized round medicine bottle without the cap. Poke the hole in the middle of the circle, and down the hole will pop. This is a time-tested trick Rudnicki learned from her mom. To enter and win a copy of The Food Allergy Mama’s Baking Book and a 2 oz. bottle of Nielsen-Massey Madagascar Bourbon Pure Vanilla, please comment on this post with your favorite holiday baked goods or food allergy story. For an additional entry, post my button on your blog (see code on sidebar), follow my blog, follow me on Twitter, follow Food Allergy Mama on Twitter, fan me on Facebook, fave me on Technorati or subscribe via email or subscribe via reader. Leave an extra comment letting me know what you did for each additional entry. Disclosure: I received a copy of The Food Allergy Mama’s Baking Book and a teeny adorable bottle of Nielsen-Massey Madagascar Bourbon Pure Vanilla to facilitate this review. I love Kelly's book! Our son has had such severe food allergies since he was a baby. it was so awful when he had to be take to the ER because his lips began to swell. We now carry his Epi Pen everywhere, read all labels, and we cook a lot of homemade stuff using kelly's book! The recipes are amazing and easy and my little guy loves them. I just want him to feel normal and this helps so much, especially now that he is in school. Plus they are so yummy we all eat them allergy free! He used to have intolerances too that caused awful eczema, and after tons of tests and doctors we had our prayers answered through Belly Boost probiotics for kids. He can eat so much more and his skin looks amazing. Anyway - we love Kelly's cookbook and I am so thankful for it! Oh and I am @smilinggreenmom on twitter and smilinggreenmom@gmail.com if I were lucky enough to win! I would give it to my mother in law who also has allergies!